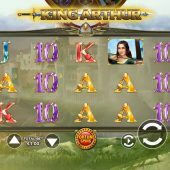 King Arthur slot is a title given to a few existing slots from other developers already, but the one you may have seen before is Microgaming's King Arthur. At least Quickspin did their homework when making their version and called it Mighty Arthur so now that possible confusion is out of the way, how does Nextgen's King Arthur fare? Well, some misty coastal hills with a castle form the background for the semi-transparent reels and we play to some medieval music and jousting sounds to complete the effect. So will leaving Camelot with some of our bankroll be easier than pulling Excalibur from the stone? We have a standard 5x3 grid with King Arthur slot and 10 fixed pay lines. Symbols are stacked up to 3 rows high bar the Wild which is 2 rows in all cases and forms our best 5-of-a-kind pay at a substantial 500x bet and when both rows of the Wild are in view, they also count scattered too. 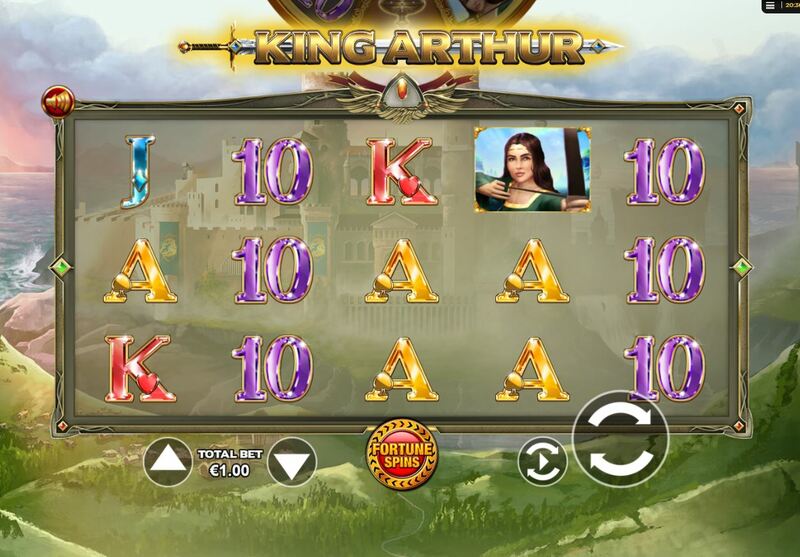 Guinevere and Merlin pay 10x, Excalibur 8x with five card values paying 8x too for the A or K and 6x for the lower three. Gold bonus scatters appear singly on all reels too. Now the fun can begin! This is a modifier which occurs randomly on any losing spin and a Red Knight and Blue Knight charge across one or two of the 3 rows from opposite sides. If on different rows they turn at least 3 symbols into a mystery symbol thus guaranteeing a minimum of two 3-of-a-kind wins as during this modifier the lines pay from right-to-left too. If they are charging each other on the same row, they clash in the middle and throw extra Wilds onto the grid. 3 or more bonus scatters will award 10, 15 or 20 free spins which may be retriggered and you also get 5 extra spins for 2 scatters. Whichever symbol is in the window in the King Arthur Round Table wheel above the grid now acts as an expanding scatter as in Book of Ra for example. This means that 3 or more in view will award their pay, multiplied by 10 due to the 10 pay lines through them. Wilds do not substitute for the expanding symbol. You can select to pay up to 10x your 10-coin stake for a spin. As you raise the stake the expanding scatter pays as in the free games described above will apply to the base game too, but only for the random one showing in the Round Table over the grid. Raising your bet eliminates the lower symbols from that Round Table as you go. On maximum 10x stake you will have removed all card values from the table. On all of the enhanced bet levels a Grail will be added to the wheel which when landing will either do nothing, or if a full Wild is in view will award a cash multiplier which appears over the Grail. The jousting feature occurs more frequently too when playing in this mode due to more losing spins.